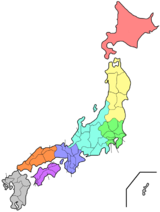 Gifu Prefectur (岐阜県, Gifu-ken) is a prefectur in the Chūbu region o central Japan. Its caipital is the ceety o Gifu. ↑ "岐阜県の人口・世帯数人口動態統計調査結果". Gifu prefectural website (in Japanese). Gifu Prefecture. Retrieved September 11, 2011. This page wis last eeditit on 8 Mairch 2018, at 04:45.